Everybody keeps on sampling the best and cleanest piano ever! here is a completely different approach. 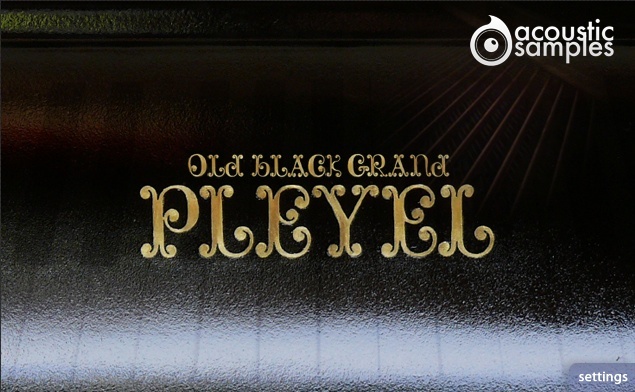 We sampled an old Pleyel Grand Piano (F-71240 model from 1928) with vintage gear like a studer console and tube microphones, it has the rich and warm sound of the old jazz/blues or even classical music recordings. 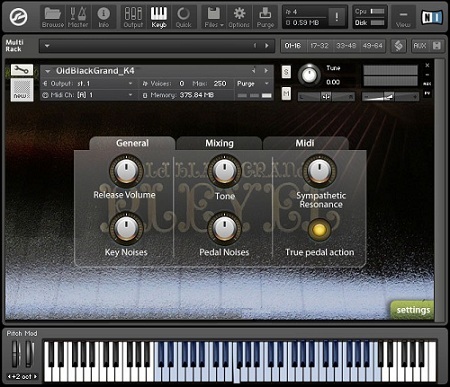 Here you can change most of the basic parameters of the library, the volume of the releases, the noise the keys produce, the amount of sympathetic resonance, the volume of the pedal noises, you can also change the tone and enable the "true pedal action" (a feature that we introduced that allows the pedal down resonance to fade in when you press the pedal even if the note was started with the pedal up). We recorded the OldBlackGrand with two pairs of microphones. One was placed inside the piano, close to the strings and the other one outside of it about where a soloist would be placed. You can change the volume and pan of each microphone position as well as play them all together to get the sound that you really want. You have two way to adjust this library to your playing style / keyboard. - The Map is a velocity remapper. You can tweak the imput/output velocity mapping. You can find some presets in the velocity curve menu. - The sensitivity decides how the volume is changed with velocity. You can also choose a "min velocity" under which no sustain sound will be played. You will still hear the key noises as on a real piano. Advanced scripting capabilities for a real mechanical behaviour simulation and polyphony saving. Una consulta: con esto http://www.m-audio.com/products/en_us/Audiophile192.html puedo hacer que suene como en el video o necesito algo más potente?